Medical marijuana patient spends 21 days in jail before his case is dismissed. A little more than a year ago, Richard Steenken obtained a doctor’s recommendation for marijuana. He applied for and received a state patient ID card in case, he said, police questioned him. He grew his own marijuana plants. And then he was arrested for growing plants in his home. Despite his card and prescription, he was held in jail for 21 days before his case was dismissed. The SLO County Sheriff’s Department, which executed a search warrant on his home, said he was not complying with California law. Steenken maintains that he was harassed by the Sheriff’s Department. It’s not clear what kind of investigation was done before deputies arrived, armed and dressed for SWAT operations, at Steenken’s home, and then his girlfriend’s less than three hours later. What is evident is that in the six days between the time a warrant was issued and served, Sheriff’s detectives didn’t check with the county health department to see if he had a patient card—recognized by the state as the best form of documentation for medical marijuana patients. Sheriff Sgt. Rick Neufeld said that step would generally be part of an investigation. He couldn’t say why it wasn’t done in this case. Medical marijuana is still a gray area in California law. Proposition 215 was passed by voters in 1996 to decriminalize marijuana use for patients with a doctor’s recommendation, but it left law enforcement without a clear explanation of what to do with someone growing or using marijuana medicinally. Senate Bill 420 was supposed to clear up some of the confusion. It created the patient ID card, which allows a person to grow, transport, and use marijuana without being subject to arrest, under certain conditions. 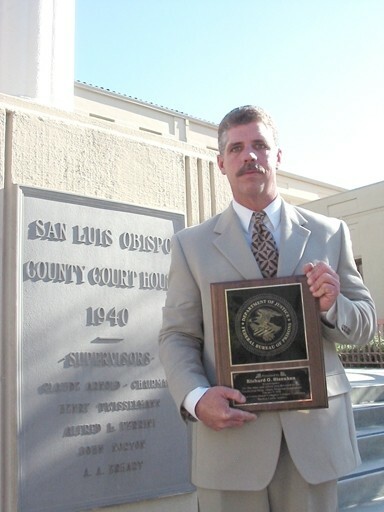 SLO County Sheriff Patrick Hedges’ department has a reputation for testing those conditions. In August, following the conviction of local marijuana dispensary owner Charles Lynch, Hedges handed out a new set of guidelines from the Attorney General—the head of all law enforcement in California—aimed at helping law enforcement deal with medical marijuana. The guidelines are clear that a patient with a valid card, if there’s no other indication of illegal activity, should be released from custody and their possessions should not be seized. In late September, Steenken’s landlord called the Sheriff to report the marijuana crop and about three weeks later armed detectives arrived with a search warrant. Steenken came home in the middle of the raid on Oct. 15 and found a dozen deputies, armed with assault rifles, rummaging through his belongings. According to a Sheriff’s report following the raid, Steenken had 43 marijuana plants, each smaller than eight inches; 54 grams of dried marijuana; and some concentrated marijuana—hash. Steenken handed over his ID card and a doctor’s recommendation to deputies as soon as he got there. One of the detectives called a number on the ID card to check its authenticity, but, according to the report, there was no answer, so detectives couldn’t verify it. (New Times made several calls to the number and received no answerer and no returned calls, just a voice recording.) Using a state web address, also posted on the card, however, New Times was able to check the card—in less time than it took to leave a phone message. The card was good. Steenken’s doctor’s note was a different story. Sheriff’s deputies saw that it was more than a year old, leading them to believe it was no longer valid. Steenken’s lawyer said that was a moot point. Steenken was charged with growing marijuana and possessing concentrated marijuana. Steenkin could not post bail, so he sat in jail until his first pre-trial hearing. According to Deputy District Attorney Charles Blair, as soon as the doctor confirmed Steenken’s patient status, the case was dropped. Steenken’s lawyer, Ken Cirisan, went to Steenken’s doctor while he was jailed, and had the recommendation renewed. Why the card wasn’t checked before the raid, he said, is a mystery. The amount of plants and marijuana a patient can possess are gray areas in the law. One state court ruled that limits imposed by SB 420 are not lawful, because they amend a more powerful piece of legislation—voter approved Proposition 125. The Attorney General has challenged that, and the matter will be reconsidered by an appellate court soon. Sgt. Neufeld said that, no matter his patient status, Steenken was over the prescribed limit. The Attorney General’s guidelines don’t help much. They offer that a patient should have no more than 14 plants, unless a doctor recommends more. Many patients believe that they are allowed to have as many as 100 plants, especially if they are growing for other patients. For his part, Blair said that the number of plants Steenken had, and the quantity of marijuana, did not seem excessive, given the doctor’s recommendation. Blair said the medical marijuana laws have a lot of built-in ambiguity. As a result, he said he sees a lot of medical marijuana-related cases, and so do the higher courts. Contact staff writer Kylie Mendonca at kmendonca@newtimesslo.com.